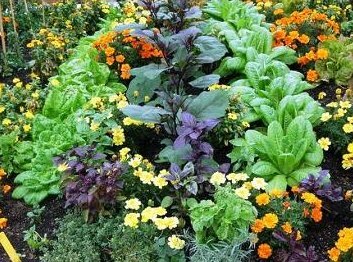 Companion planting is the planting of different crops in proximity (in gardening and agriculture), for pest control, pollination, and to otherwise increase crop productivity. It has been used for thousands of years around the world. Following are some plants and the companions that work well with them. • Companion With: beet (to bush beans only), cabbage family, carrot, celery, chard, corn, cucumber, eggplant, pea, potatoes, radish and strawberries. • Helpers: Marigold deters Mexican bean beetles. Nasturtium and rosemary deter bean beetle. Summer savory deters bean beetles, improves growth and flavor. • Do Not Plant Next To: Garlic, onion and shallots. • Companion With: bush beans, cabbage family, lettuce, onion. • Helpers: Garlic improves growth and flavor. • Helpers: Chamomile and garlic improve growth and flavor. Catnip, hyssop, rosemary and sage deter cabbage moth. Dill improves growth and health. Mint deters cabbage moth and ants, improves health and flavor. Nasturtium deters bugs, beetles, aphids. Tansy deters cabbageworm and cutworm. Thyme deters cabbageworm. • Do Not Plant Next To: Kohlrabi cannot be planted next to tomatoes. • Companions: Bean, lettuce, onion, pea, pepper, radish and tomatoes. • Helpers: Chives improve growth and flavor. Rosemary and sage deter carrot fly. • Companions: Carrot, eggplant, onion and tomatoes. • Companions: Asparagus, carrot, celery, cucumber, onion, parsley and peppers. • Helpers: Basil repels flies and mosquitoes, improves growth and flavor. Bee balm, chives and mint improve health and flavor. Borage deters tomato worm, improves growth and flavor. Dill, until mature, improves growth and health. Marigold deters nematodes. Pot marigold deters tomato worm and general garden pests. • Do Not Plant Next To: Corn and tomato are attacked by the same worm. Mature dill retards tomato growth. Kohlrabi stunts tomato growth. Potatoes and tomatoes are attacked by the same blight. • Helpers: Borage deters worms, improves growth and flavor. Marigold deters beetles. Nasturtium deters squash bugs and beetles. Oregano provides general pest protection.